A shed is located in the out of town shopping area of Ersboda, Umeå. Inside this shed are a number of warehouse stores sellinga variety of household furniture. The Shed mediates between low-density suburbia and an industrial estate. Included in the assemblage of stores that specialise in Furniture, Chairs andSofas, Kitchens, and Beds is one particular condition portraying a moment of clustered object/thing as feedback loop: Next to MIO a furniture store specialising in chairs, beds and household nik-naks is the Red Cross second hand store. 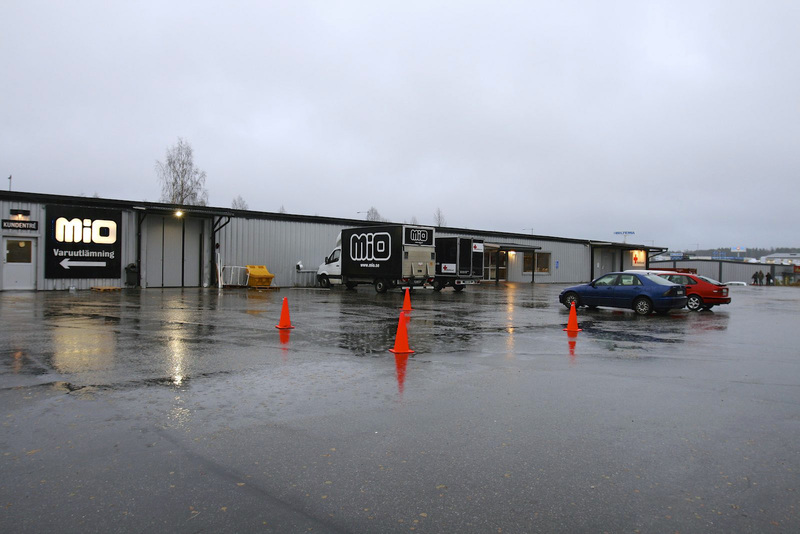 An internal storage yard belonging to MIO divides the two stores, which are really large rooms. here Return Boutiques, of which the Red Cross is one, have their work cut out. While run as a Swedish company MIO’s furniture production and cross brand products are produced globally and brought together in retail warehouses. The Red cross is a global institution, an apparatus of colonisation that sources goods from local production/donation sources. To be something local and to get that touch of Swedish authenticity one travels to a global retailer and back in time. A live video feed is placed in a furniture store MIO, the feed links directly to a live feed of the RED Cross which is within the same building but separated by MIO’s delivery and storage room. A Live video feed is placed in the Red Cross the feed links directly to MIO. When inside Mio the spectator will walk through the landscape of suburban living rooms without walls and eventually come across the feed of the Red Cross which is broadcast on an advertisement scale screen 159 x 234 cm. In the red Cross is an identical broadcast with a live feed to MIO set at the entrance overlooking the display of sofas and tables. The feed is delayed approximately twenty minutes from MIO to Red Cross and vice-versa. 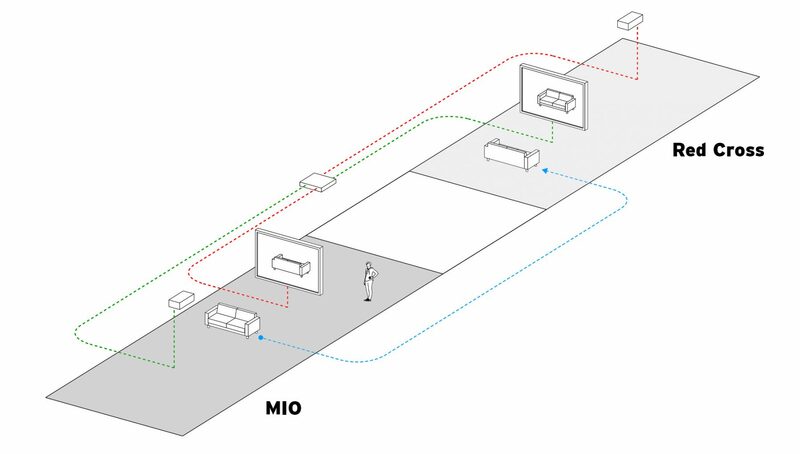 The monitors present the shed as a spatial continuum by removing the walls between MIO and the Red Cross. When staring into the window of MIO from the Red cross the spectators are presented with objects of the past relative to their position; that is that in the cycle from MIO to Home to Red Cross objects in MIO are from the past because in the future they will be in the Red Cross. While in MIO spectators view objects in the Red Cross which are from the future; that is the Red Cross is full of objects of the past presented as the space of the future relative to MIO. The time delay also means that you can witness yourself browsing in the future/past condition of the time delay broadcast. Diagram Relay Broadcast Future/Broadcast Past.